So much for the No. 1 ranking. So much for the 3-0 record that co-op Glenbard carried in regular-season games over Waubonsie Valley. With a trip to the United Center on the line in Tuesday night’s first semifinal game of the Illinois High School Hockey State Tournament (Combined Division), played at The Edge Ice Arena in Bensenville, Waubonsie toppled top-ranked Glenbard, 4-3. 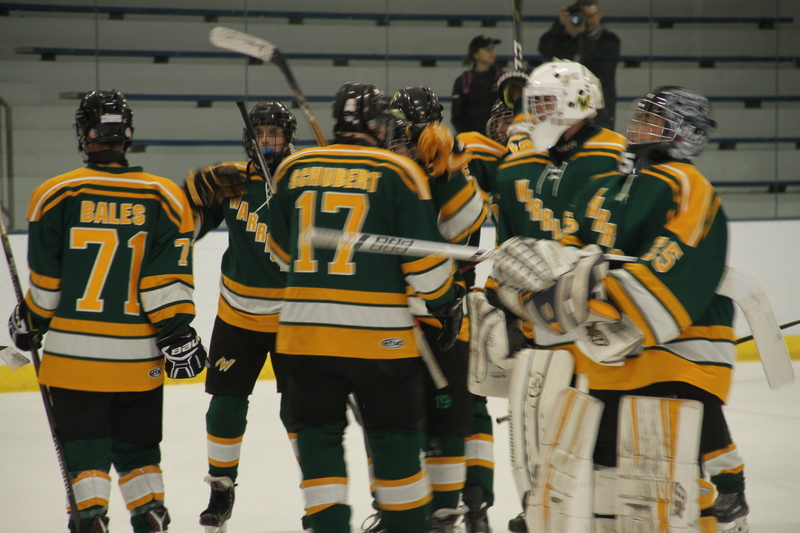 Waubonsie will now face BG/H/W on Saturday, March 24, for the State Championship after the Stampede stopped AWF, 2-1. “We’ve been working really hard lately and have peaked at the right time. Everyone is on the same page, everyone is believing,” said Waubonsie coach Jimmy Frasco. The Warriors came out flying, opening the scoring at 10:51 of the first period on the first of two goals on the night from captain Cade Kenyon, and it was 2-1 after the first period. And the second period was all Waubonsie, specifically, Pearce, as he tallied twice in less than five minutes, giving Waubonsie a 4-1 edge after two periods. “There definitely were some nerves going into the third (period) because we didn’t want to lose that edge,” said Pearce, who was assisted on his first goal (for the 3-1 lead) by Michael Alberts and Zach Stobart, and by Zach Lupori on his second tally. Glenbard’s Sam Ruffolo scored at 13:52 of the third period, assisted by Martin Gavac, to cut the score to 4-2. And Ruffolo made it 4-3 less than two minutes later, assisted by Zach Lupori. “Our goalie (Alex Lee) got hot and made some key saves at the end,” said Frasco, who led Waubonsie to the 2014 State Championship, defeating Glenbard that year at the UC. Lee made 44 saves, including 25 in the second period. Glenbard goalie Elijah Felton had 24 saves. “Everyone is hyped for the (championship) game; we’re all excited, but now just have to stay level headed, work hard in practice and come ready to play,” Kenyon said. Kenyon will, no doubt, be ready when he steps on the ice at the UC. “Kenyon is the heart and soul of this team and just doesn’t want to get beat right now,” Frasco said. Glenbard head coach Jason Hawkins said his club came out a bit nervous but was “flying” by the third period. “We just couldn’t find a way to tie it up,” he said. The loss was Glenbard’s first in five semifinal game appearances. BG/H/W returns to the UC for the second time in three seasons, with big credit going to forwards Brendan Buckley (Hersey) and Connor Kelly (Buffalo Grove). Buckley scored the game’s first goal at 14:21 of the second period, then the game-winner at 6:24 of the third period. Kelly assisted both. 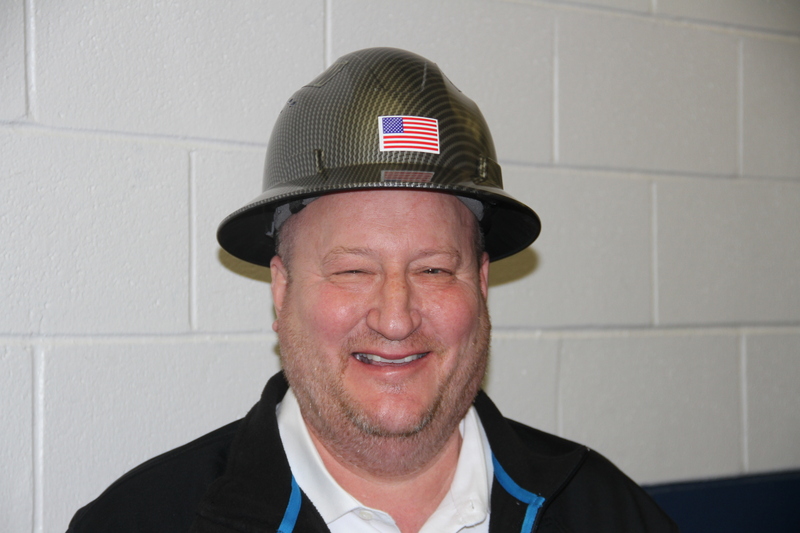 Buffalo Grove hockey director Bob Wagner celebrated the team’s semifinal win in a hard-hat. Not just any hard-hat, but the one award to the Player of Game by the team. Freshman forward Alicia Kim had 7 goals, 4 assists in 13 Metro Girls games for co-op Glenbrook South, which finished the regular-season with a 7-2-3 record. Can the youngster shine under the ultra-bright United Center spotlight? After all, GBS is looking to repeat as state champions, despite only earning the No. 3 seed in the 8-team girls state tournament. New Trier, meanwhile, has been nearly untouchable this season, carrying a 20-5-1 record and has outscored its opponents 124-43. Kim already has 2 game-winning goals this season, and I think she’s going to grab one more – at the United Center, helping Glenbrook South shock No. 1-seed New Trier, 4-3. Red Division – 3 p.m.
Will Loyola Gold finally END THE DRAUGHT, as is emblazed on sweatshirts that many at Loyola, including players, are wearing these days? The Ramblers won the state championship in 1995 and 1996, but is 0-7 in state championship games since that last title, most recently losing to St. Rita in the 2010 finals. Stevenson, meanwhile, is skating in the team’s first-ever state championship game. Heck, the semifinal win over GBS was the school’s first-ever semifinal appearance. The game features two of the best goalies in the state: Hugh Brady for the Ramblers and Elias Sandholm for Stevenson. So, I think it will be a low-scoring, one-goal game. And when Jackson Leptich scores upper-corner, it will be the game-winner. 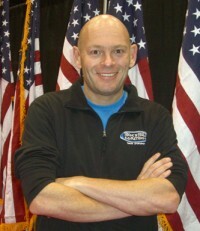 Combined Division – 5 p.m.
Wagner will be on the bench for the final time, so the emotional edge certainly leans to BG. But Waubonsie has been surprising teams all season. Heck, they jumped out to a 4-1 semifinal lead over the No. 1-ranked team in the state, Glenbard. Waubonsie features studs in Kenyon and Pearce, plus other standouts such as Jack Flood, Michael Alberts and Nate Kozari, among others. Waubonsie last won state in 2014. But I think Buckley will shine again, and again score two, helping BG/H/W win, 4-1.